John Sammers combines Classic Britpop, Hypnotic Rock riffs, Acoustic Roots Folk and Signature Guitar Solos. He tells it like it is with stories of love, loss and freedom. The song and video is in support of the protest to stop the Dakota Pipeline violating sacred tribal grounds and putting the waters of the Missouri and Cannonball rivers at risk. All proceeds from the sale of the song will go to the Standing Rock Sioux Tribe. 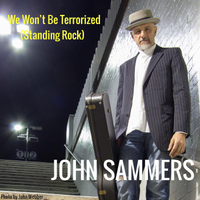 We Won't Be Terrorized (Standing Rock) was produced and recorded by triple Grammy award winning producer Justin Guip with additional recording by Phil Rigger and John Sammers. It is a song from John Sammers' forthcoming album Believe. The song was performed by John Sammers with Justin Guip on drums. The video was assembled and produced by Mat Clancy.